In case you often forget the Passcode for Notes App, you will be pleased to know that it is now possible to Unlock and Lock Notes using your Fingerprint. 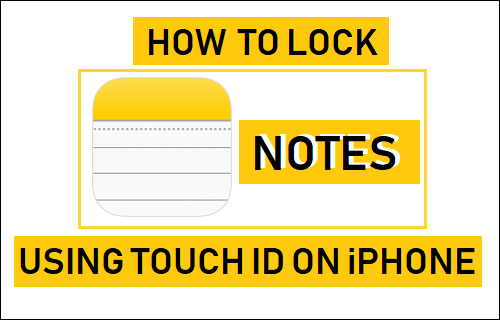 You will find below the steps to Lock Notes On iPhone Using Touch ID. The Notes App on iPhone allows you to record/store useful information and access this information at any time on your iPhone, iPad or Mac. If this information is personal or something that cannot be disclosed to others, you can either Password Protect Notes or use Touch ID to Lock and Unlock Notes on iPhone. In order to be able to Lock Notes using Touch ID on iPhone, you will have to enable this option within the Notes App. Once Touch ID is enabled for the Notes App, you will be able to Lock and Unlock Notes on iPhone using your fingerprints, instead of typing a Passcode. You can skip this step if you are already using Touch ID or Finger prints to unlock your iPhone. 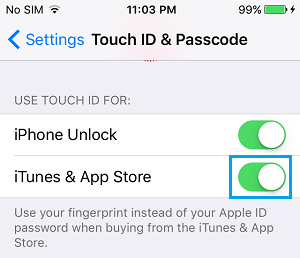 If not, you can follow the steps as provided below to Enable Touch ID on iPhone. 2. On the Settings screen, scroll down and tap on Touch ID & Passcode. 3. On the pop-up, enter your Lock screen Passcode. Note: If you are setting up Touch ID for the first time, you will be prompted to register your Fingerprint. Simply, follow the instructions as they appear on the screen of your iPhone and complete the process of registering your fingerprint. After setting up Touch ID on iPhone, you can follow the steps below to enable Touch ID for Notes App. 2. On the Settings screen, scroll down and tap on Notes. 3. On the next screen, scroll down to “VIEWING” section and tap on Password. 4. 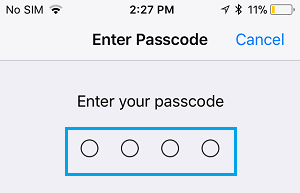 On the Set Password screen, type a Password, verify the password and enable Use Touch ID option by moving the toggle to ON position. Note: Even though you are trying to setup Touch ID, you will still be required to setup a Four-Digit Passcode for the App. After this you will be able to Lock and Unlock Notes on your iPhone by using your fingerprint, instead of typing a password to unlock Notes. Even though you have enabled Touch ID for Notes App, it is still possible for the Notes App to display your Notes in the Widget screen of your iPhone. Hence, follow the steps below to disable widgets for the Notes App on your iPhone. 1. Swipe left on the Home screen of your iPhone to open the Widget screen. 2. Scroll down to the bottom of the screen and tap on Edit. 3. On the Add Widgets screen, tap on the Red circle located to the left of the Notes App and tap Remove to confirm. Now, the Notes App won’t be able to display any information in the Widgets area. Now that you have setup Touch ID for the Notes App, you can Lock a Note at any time on your iPhone using your Fingerprint. 1. Open the Notes App on your iPhone. 3. Once the Note is open, tap on the Share Icon located at the top-right corner of your screen. 4. On the action menu that appears, tap on Lock Note. 5. Use Touch ID to Lock your Note. Note: You may be prompted to enter your Notes Password at least once, before being allowed to use Touch ID. Enter Password and you should be prompted to use Touch ID. 6. Even though you have Locked the Note using Touch ID, you still need to tap on the Lock icon located at the top of the screen in order to Lock the Note (see image below). Once you tap on the Lock icon, you will see “This Note is Locked” message on the screen of your iPhone, confirming that the Note is now locked.